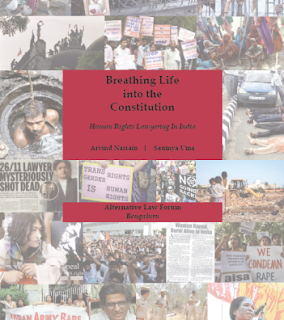 In a controversial observation, a recent book on human rights lawyering has said that there are greater possibilities of success in legal struggles for the victims of caste-based discrimination than communal violence. The book, titled "Breathing Life into the Constitution: Human Rights Lawyering in India" by Saumya Uma and Arvind Narrain, believes that this is because communal violence is often perpetrated for political gains, to "enjoy" political clout. Pointing out that the struggle for justice in cases of "communal violence brings the human rights lawyers in direct confrontation with the state and its political might", the book says, as for atrocities against Dalits, there is a possibility that "one can work towards the application of a specific law, i.e. the scheduled caste (SC)/ scheduled tribe (ST) Prevention of Atrocities Act." The book continues, "In the context of communal violence, the struggle is made more difficult by the fact that there is no specific law that one can work with" and the "Indian criminal law is geared towards crimes against individuals rather than against collectivities", even though communal violence "involves criminal offences committed against collectivities, targeted on the basis of religious identity." According to the book, this is the main reason why "human rights defenders and other concerned citizens have been advocating for a special law on communal violence since 2004." Suggesting that this hurdle was the main reason why Ahmedabad's Centre for Social Justice (CSJ) adopted a deliberate policy of quietly fighting for Gujarat communal riot victims, CSJ's Gagan Sethi has been quoted as saying: "Operating as a human rights lawyer while working within a state and with a state machinery, which is so nasty, is very difficult compared to being outside the system." According to Sethi, "Though there were times when we had to face the brunt of the state, as a policy we did not come into the media. We have always underplayed our work, as a strategy." Things are different with regard to caste discrimination. The book quotes Gujarat Dalit rights NGO Navsarjan's Martin Macwan as saying that, following the 1986 massacre of six Dalits in Golana and successes in the legal battle against the upper castes, which led to life sentence to 11, "it became possible for Dalits to say that if you perpetrate atrocities like Golana, you will go to jail." The book notes, "Termed as the biggest conviction that Gujarat witnessed on the caste question, Macwan opines that the response to a single incident was responsible for the decrease in incidents of Dalit atrocities and age-old oppression across Gujarat." Suggesting that human rights lawyering, despite its hurdles, has had seen major successes, the book believes, one them was in September 2014, when "a five judge bench of the Supreme Court, headed by Chief Justice RM Lodha, reworked the norms for death penalty cases, to ensure transparency, greater public participation and closer scrutiny." The book believes, other hurdles which human rights lawyering faces include lack of viable networking among organizations and lawyers who represent cases of the downtrodden sections, absence credible socio-economic data in petitions on environmental violations, and lack of funds. Calling funds a key challenge faced by human rights lawyers, the book states, "The work that human rights lawyers do is not remunerative and hence it’s very difficult to sustain the work year after year", adding, in the "current era of globalization the ‘gap’ between human rights lawyers and commercial lawyers has really opened out." Quoting top Mumbai-based advocate Mihir Desai, the book states, the income differences are so vast that sustaining a human rights practice is even more difficult in the current scenario. The socio-economic and political changes have been massive. What would have worked earlier need not necessarily work now. "To work and survive as independent legal professionals and stick to the kind of principles we have has became very difficult", Desai says.